Start off your visit on the 12th (Fri): appreciate the extensive heritage of Ocean Avenue and then take a leisurely stroll along Santa Monica Pier. To find traveler tips, maps, more things to do, and tourist information, refer to the Santa Monica online visit planner . Kalamazoo to Santa Monica is an approximately 8.5-hour flight. You can also drive. Due to the time zone difference, you'll gain 3 hours traveling from Kalamazoo to Santa Monica. Prepare for a bit warmer weather when traveling from Kalamazoo in April: high temperatures in Santa Monica hover around 70°F and lows are around 55°F. Finish your sightseeing early on the 13th (Sat) to allow enough time to travel to Yosemite National Park. 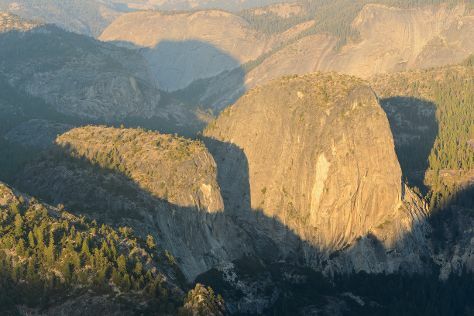 Visiting North Dome and Glacier Point will get you outdoors. Bring the kids along to Fishing Charters & Tours and Cathedral Beach Picnic Area. Spend the 15th (Mon) exploring nature at Bridalveil Fall. Spend the 18th (Thu) exploring nature at Elizabeth Lake, Yosemite National Park. Next up on the itinerary: hike along Mariposa Grove of Giant Sequoias, take in the dramatic scenery at Vernal Fall, don't miss a visit to Yosemite Conservation Heritage Center, and look for all kinds of wild species at McGurk Meadow. For other places to visit, traveler tips, maps, and other tourist information, go to the Yosemite National Park attractions planner. Traveling by combination of flight and car from Santa Monica to Yosemite National Park takes 5 hours. Alternatively, you can drive; or do a combination of bus and car. Traveling from Santa Monica in April, you will find days in Yosemite National Park are little chillier (59°F), and nights are colder (28°F). Cap off your sightseeing on the 19th (Fri) early enough to travel back home.